Updated In its effort to attract a more diverse workforce, Amazon is sending mixed messages. 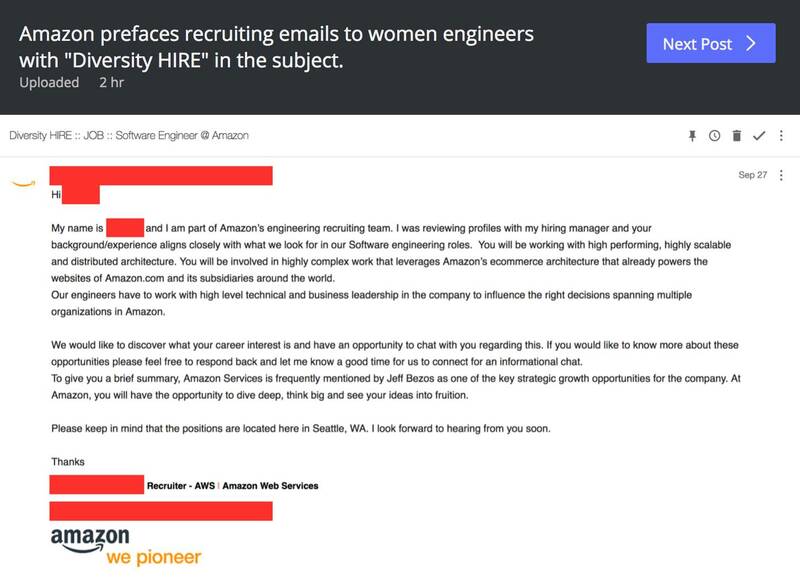 An email shared online earlier today was sent by an Amazon Web Services recruiter to a woman encouraging her to apply for a software engineering position. The message kicked off with the subject line: "Diversity HIRE :: JOB :: Software Engineer @ Amazon." It may as well have started with: "Dear token minority..."
The Register asked Amazon to shed more light on the poorly worded email. A spokesperson said they would get back to us. In the meantime, El Reg has contacted the email's recipient. She was not immediately available for comment. However, we understand the email is legit, and it was sent by a temporary recruiter. It was not approved by any higher ups, and does not conform to the cloud giant's official hiring practices. Marilyn Loden, a Florida-based author and diversity consultant, told us in a phone interview that this is not the way to approach diversity. "You don't put people in a category that is going to put them at a disadvantage," said Loden. "The way to integrate groups that are disadvantaged is not to call attention to them." Loden said doing so feeds into the backlash against women in tech by those who feel female candidates are getting jobs solely because of gender. "That just makes everyone in the organization angry and encourages the perception that this is not a merit-based hire," she said. Amazon faced criticism for its lack of diversity in 2014 when the web giant said 63 per cent of its workers and 75 per cent of its managers worldwide were men. Since then, it has made an effort to become more diverse and has made some progress. In November 2014, Amazon said 15 per cent of its US workers were black and 9 per cent were Hispanic. As of July 2016, those figures had risen to 21 per cent and 13 per cent respectively. Gender diversity has shifted less, from 63 per cent male and 37 per cent female globally in 2014 to 61 per cent male and 39 per cent as of July 2016. And the gender breakdown among Amazon managers around the world remains 75 per cent male, 25 per cent female. Nonetheless, OpenMic, a nonprofit that advocates for racial diversity, in a February 2017 report slammed the US tech industry as a monochromatic bastion of white privilege. It noted, "Amazon's US employees of color are often found in underpaying warehouse jobs with poor benefits, rather than in tech jobs that pay well and offer good benefits." And Uber's infamous culture problems have underscored the continuing challenges women face in the tech industry. Diversity isn't merely a matter of public relations and appeasing critics. A report released last year by consultancy Dalberg and Intel found that increasing ethnic and gender diversity could add $470bn to $570bn in value to tech companies and from 1.2 per cent to 1.6 per cent to the national GDP. "In addition to highly competitive wages that pay 30 percent above the national average of retail workers, Amazon provides fulfillment employees comprehensive benefits that include health insurance, disability insurance, retirement savings plans, performance-based bonuses, and company stock. "The company also offers up to 20 weeks of paid leave and innovative benefits such as Leave Share and Ramp Back, which give new parents flexibility with their growing families. Leave Share lets employees share their Amazon paid leave with their spouse or domestic partner if their spouse's employer does not offer paid leave. Ramp Back gives new moms additional control over the pace at which they return to work. Just as with Amazon's health care plan, these benefits are egalitarian – they are the same for fulfillment center and customer service employees as they are for Amazon's most senior executives. "Amazon also offers hourly employees the innovative Career Choice program that pre-pays 95 percent of the cost of tuition for employees to pursue courses related to in-demand fields, regardless of relevancy of the skills to jobs at Amazon."